This is the second in a four part series on nuclear waste which is running on BraveNewClimate.com over a four-day period, authored by Geoff Russell. Click here for Part 1. Everyday items can kill – do you see the ingested button battery in this x-ray? What’s special about nuclear waste? In Part I, we found that radioactive decay in the earth’s crust is continuously releasing as much energy as 44 million large nuclear reactors. Is that troubling? Presumably not. I’ve not heard calls from anti-nuclear activists like Helen Caldicott or Jim Green to seal the surface of the planet with a layer of lead to save future generations from horrible deformed babies. So what is it about nuclear power waste disposal that people find so troubling? Dig a hole into that crust and replace some naturally radioactive rock that hasn’t moved for billions of years by the aforementioned waste. Fill and forget. Of all our hazardous waste disposal problems, this is one of the few that’s been properly solved. Others remain unsolved and kill large numbers of people on a daily basis. What exactly are the differences between the waste-products of nuclear electricity generation and those from other energy sources? Nuclear waste quantities are small and contained. A typical reactor produces about 30 tonnes of high level radioactive waste per year. This is fuel rods rendered quite safe by a suitable layer of water. Most long term disposal plans involve melting and mixing the rods with ceramic material of some kind to create a stable compound. After this, the 30 tonnes of rods will occupy just a few cubic meters and there are many ways of disposing of them safely and permanently. More about this later.But a coal plant with a similar electrical output will be producing 400,000 tonnes of coal ash containing variable amounts of arsenic, mercury and chromium. These poisons don’t have half lives, but are toxic forever. They have, just like nuclear fuel, been mined from the earth’s crust but, unlike spent nuclear fuel, they are incredibly hard to collect and return to their source. Compared to coal waste, dealing with nuclear waste is a stroll in the park.Once released into the atmosphere mercury goes on to poison all kinds of wildlife, particularly fish. The US National Research Council estimates that ingestion of contaminated fish puts tens of thousands of children a year at risk of diminished brain development. The nuclear waste problem is centralised and doesn’t involve too many people or locations. Consider in contrast the humble button battery. Stopping these slippery suckers from making children really sick is difficult because it relies on billions of people being sensible and vigilant (see x-ray image at the top of this post). Which makes digging big holes in rock look like child’s play. Over the past decade, the number of children treated in the US alone for battery related injuries has risen steadily from about 1,500 per year to over 6,000. The per-capita rate in Australia is similar. What’s a battery related injury? Typically it’s a button battery stuck in a child’s throat. It’s not that the batteries leak, and it makes no difference whether they are made with or without mercury. There is simply an electrochemical reaction at the battery anode which causes a burn that can result in injury and bleeding which is really tough to stop and can continue long after the battery is removed with about one child dying in the US each year. As the energy ratings rise in these batteries, so does the damage of each accident. Somewhat paradoxically, stuff that’s dangerous and which everybody knows is dangerous is far more likely to be safely handled than stuff that is dangerous but which people take for granted. So the latter can end up causing far more suffering and death than the former. 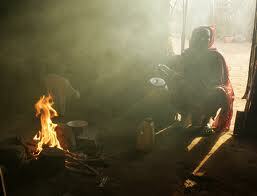 There are currently about 3 billion people on the planet who cook with biomass … mainly wood and cattle dung. The waste from this renewable energy source is called smoke and kills about 3.5 million people each year, including about half a million children under 5 years old … mainly from pneumonia. And these deaths are just the extreme tip of a vast disease ice-berg. Anti-nuclear campaigners in India are busily working to stop nuclear projects that will help replace biomass burning and its consequent suffering with electricity. They are busily telling villagers who cook with wood and poison their children on a regular basis that nuclear electricity is dangerous. The nuclear industry is profitable enough to pay for waste management to be done right. Try telling a seller of firewood or a collector of cattle dung that they need a smoke management plan in place before they sell or use their product. Similarly, people will be falling off ladders and roofs all over the planet for as long as people are installing and cleaning rooftop solar panels. The company whose installers work without scaffolds and good safety procedures will undercut the ones who do. The do-it-yourself brigade will undercut them both and together they’ll keep the hospital emergency services humming along nicely. And in developing countries it’ll be nimble footed children doing some of the falling and the good medical help won’t always be available. During the past 25 or so years, the difficulties of building new nuclear plants because of organised opposition has allowed coal fired power stations to proliferate without resistance despite much larger and more deadly waste problems. Apart from the permanently dangerous heavy metals, there’s also sulphur dioxide and nitrogen oxides. All of these are tough waste management problems. Not to mention the rather famous carbon dioxide problem. So while the anti-nuclear movement has been busily muzzling a small white shih tzu lap dog with tall tales of razor sharp teeth, a pack of giant Pleistocene hyenas has been ripping the throat out of the planet. Part III will provide some case studies on possible nuclear waste management futures as well as a look at past disposal methods.